Once upon a time, not so very long ago, a beautiful princess worked at the bakery in an Arizona Target. Nearby, in the deli of the same Target, worked a handsome prince. He took on the perilous journey of crossing the children’s toy aisle, and the dangers of the women’s sale sections to reach the fair maiden. After conquering his quest across the store, he announced his love for the princess! And she… turned him down cold. Okay, so not exactly like any fairytale ever written. But, their fairytale was far from over! Not long after they met, prince Patrick left Target and moved to Wyoming to pursue his masters degree in geology. It wasn’t until after Patrick left, that Maya realized how much she missed him! And so began a long-distance relationship. After about a year, their love story grew and princess Maya moved to Wyoming so they could be together. Upon completion of his master’s program Maya and Patrick moved to Greeley Colorado. And, as you can imagine, shortly after, Patrick surprised Maya with romantic fairytale proposal on a terrace overlooking the ocean in Mexico. In case you’re wondering, “What’s with the princess and fairytale references?”, Maya has been our Disney princess bride from day one! 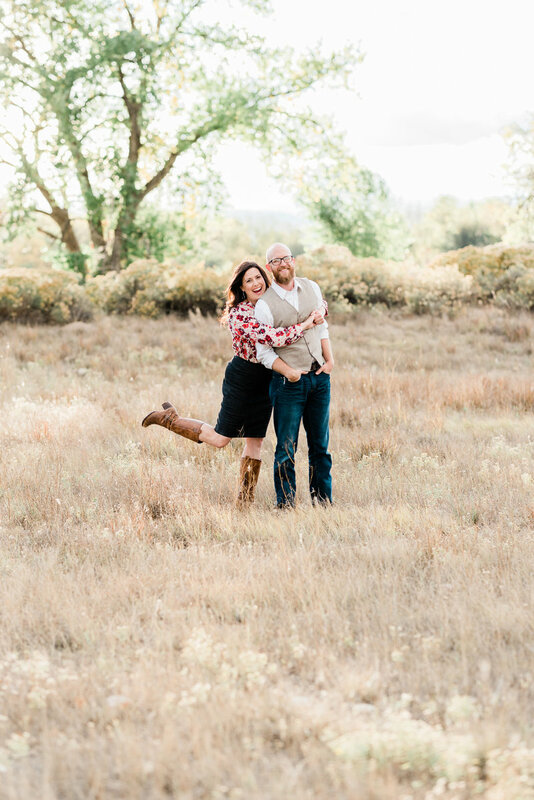 At their sunrise engagement session in Estes Park, the forest animals literally came out of the woods in Maya’s presence! Just another element of magic in their love story. Maya had a vision of an enchanted winter wedding from the very beginning and she and Patrick incorporated some very special elements into their wedding to bring her vision to life. They chose to get married in the Colorado Mountains at the Wedgewood at Boulder Creek. The Disney theme was brought into the day through Mickey ears worn by the bride and her bridesmaids in the bridal suite to Maya’s Elsa engagement ring. Special Disney pins were incorporated into the attire and accessories of both the bride and groom and various songs from beloved Disney movies were played throughout the day. Maya even went to Disney world with her bridesmaids for her bachelorette party. The Disney influence just might have been enough that Maya and Patrick could have asked Disney to help sponsor their wedding! Because this fairytale is not just about princess Maya, the couple also incorporated prince Patrick’s love of geology into their wedding details. Our favorite was definitely the rock candy accents on their wedding cake! Such a fun and unique idea! From a geode wine bottle stopper on the sweetheart table to beautiful stones included in their table decor, not a single detail was taken for “granite”… Get it? Granite? We are so clever! Adding to their fairytale day, Patrick hid secrets for Maya to find and Maya surprised Patrick with a custom designed wedding band during their ring exchange! We loved his reaction to the surprise! It is obvious that these two are head-over-heels in love with each other and enjoy sharing that love with everyone around them. Sounds of laughter filled the room while toasts were given from the Father of the Bride, one of Patrick’s good friends and groomsman, and the matron of honor. Maya and Patrick’s friends and family are among the most supportive and excited that we have witnessed. As the celebrating began, the dance floor was filled from the moment the music started. Although … Maya didn’t even need the music… she was singing and dancing from the second we set foot into the bridal suite, all the way through the reception! It can be a hard rock life, but never lose your luster. Remember, love can overcome any fault. Take a lesson from a volcano… say “I lava you” everyday! The world is made up of alkynes of people, so always be the best kind for each other! We could go on, but we’ve been pretty bold already… we wouldn’t want to be any boulder! In all seriousness, God uses the pressures of this life to refine us in incredible ways. Relying on Christ as your foundation will guarantee that you come through those pressures as strong and beautiful as the diamonds and gold in your wedding bands. Thank you again for the opportunity to be a part of the beginning of your happily ever after!